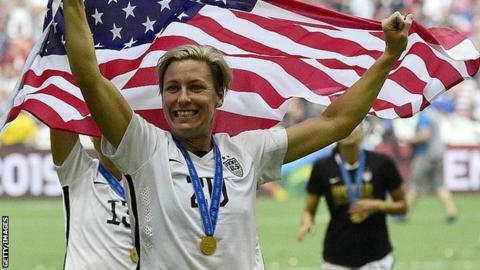 World Cup winner and two-time Olympic champion Abby Wambach has admitted taking cocaine and smoking marijuana. American Wambach, the world's all-time leading international goalscorer, was arrested on Saturday for drink-driving. Court documents connected to the 35-year-old's arrest said that "the defendant tried cocaine at age 25". Mini USA, one of Wambach's sponsors, said it was withdrawing adverts for the car featuring the former footballer, who retired in December. In a statement, it said: "This behaviour is against the values we promote as an organisation and the safety of everyone on the road is a priority here at Mini." Wambach, who scored 184 goals in 255 games and helped the USA to 2015 World Cup glory, was arraigned on Tuesday in Multnomah County Circuit Court, Portland. She was not present, but her lawyer entered a plea of not guilty on her behalf. Court documents said Wambach has no prior arrest record. In court documents, officers wrote that she first used marijuana at age 24 and her last use was at 25. A Portland police spokesman said it is standard procedure for officers to ask defendants about prior drug use.